Last night was the Peterborough Bears' Lair competition at the Peterborough Lion's Club. Judges for the regional competition included Mary Carolyn Hart, Co-owner and Manager of Lazer Graphics; Drew Merrett, owner of Merrett Home Building Centre in Peterborough; Betty Halman-Plumley, Personal Financial Specialist with Investors’ Group; and Terry Merrill, General Manager of the Holiday Inn. With forty years in the die cast manufacturing, Len and Anne Sedgwick said that they were ready to get their business running. 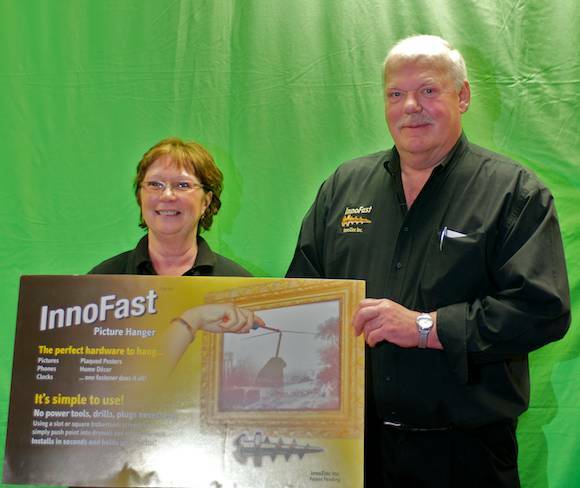 Already featured in the Toronto Star, their business makes the InnoFast, a super-duper picture hanger. Using a regular screwdriver, you screw in a self-tapping screw that will hold up to 30 pounds. If they won, the money would go towards increasing production and expansion into the U.S. The product is already in Home Hardware and Home Depot, and they have the U.S. patents (Canadian patent pending). The plan for the future would be to expand into the States and into stores such as Lowes. "It's a passion," says Anne. WISP Internet Services has coverage in Peterborough, Northumberland counties and, soon, Kawartha Lakes. Currently, they have 300 customers and 17 towers but want to expand to 900 customers and 40 towers. Owners Ryan and Chris said that they start by finding an area that is under serviced. They believe that their service (ubiquity 5.8ghz wireless) beats cellular and satellite "hands down". Every single customer they have spoken to has signed up. Their service offers no throttling or usage based billing with 4, 8 and 10mbps service ($29.95 a month, plus $299.95 installation). WISP is looking to invest money in new vehicles, a distribution centre and installation techs. Canadian Welding Skills is a privately owned and operated welding training centre. Jonathan Bennett, who started the business (and has been a welder since 1972), has numerous skills and certifications behind his name. It started as a home based operation but later expanded to a 2,800 square foot shop as demand grew. As the recent downturn in the economy occured, Jonathan and his wife Olga thought of a new idea to keep the business afloat. They launched a new project to create steel boats which have a reputation to last indefinitely. Tugboats are good for day trips, offer a very stable ride, and ride beautifully even in choppy water. The tugboat is aimed at baby-boomers who don't want a speedy boat. A boat would cost $48,000 fully painted and includes a motor. Add-on kits such as a wood cabin ($2,800), sinks, etc., are available. No one else has the capacity and knowledge to do welding in this area, Jonathan says. There is a target of 22 tugboats for completion for the next year. Jonathan forecasts that there will be two sales before the end of the winter and that his tugboats have a spot on the Trent Severn waterway because of their uniqueness. Johnston's Greenhouse have been in business since 1943 and Chris Heckel entered the Lair looking to expand and diversify the business. They are already renovating the current location and work is underway for a second, more visible location on Lansdowne Street. Johnston's Greenhouse is Peterborough's prominent "Proven Winners" distribution centre—a hearty line of plants, flowers and hanging baskets. Competition consists of "pop-up" stores that open for 6 to 8 weeks that aren't as knowledgeable, he says. With anticipated sales of $75,000 to $85,000, Chris hopes for another excellent year. Peterborough has no exclusive dealer and Home Depot already sells this line of plants, but Chris feels he has more knowledge and a better selection. The Bears went for deliberation after the pitches to go over the presentations and details of the business plans that were given to them ahead of time. Upon return, the Bears first offered feedback to each of the pitchers. The Bears felt that Johnston's Greenhouse wasn't exclusive enough, but liked the location and streetscape branding idea of their current and upcoming stores. 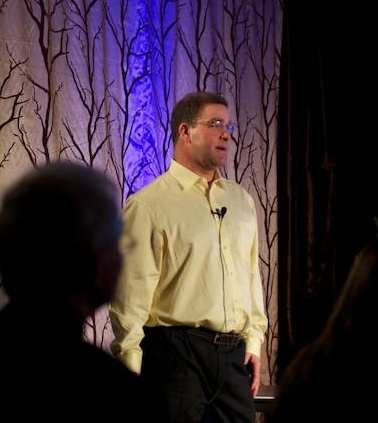 InnoFast showed the Bears an entrepreneurial spirit, but they were worried about knock-offs. The Bears felt that the WISP presentation was fantastic. But they were leery about big boys entering into town and taking over. Impressed with taking stock of the economic downturn and solving it, the Bears applauded Canadian Welding Skills' entrepreneurship. Their concern was with the number of boats that they thought would sell. Stu Harrison, General Manager at Greater Peterborough Chamber of Commerce, then announced that the winner was.... drumroll, please... InnoFast, and that they will now go on to compete against the other winners from the Bears' Lair in Haliburton, Northumberland County and the City of Kawartha Lakes. That grand finale takes place on March 1st at Showplace with a grand prize of more than $20,000 worth of business products and services. Robert Herjavec from the CBC show Dragons' Den will be a guest judge and keynote speaker.